This paper presents research undertaken for a PhD between 1997 and 2000 in the United Kingdom. The study explored three themes, the use of electronic information in everyday life, the use of telecentres by local communities in everyday life and community involvement strategies in the design, development and implementation of telecentres. Results led to development of a framework to inform future community based ICT initiatives. The findings and methods used to analyse the data are relevant to both future study of community-based ICT initiatives and the broader areas of information seeking, information seeking behaviour and user needs. Consequently, it is hoped they will be used by other researchers wishing to take a qualitative approach when studying in these areas. This paper will report findings relating to the use of electronic information in everyday life, setting these findings within the context of the whole study. The full PhD thesis is available on-line. This paper presents research undertaken for a PhD between 1997 and 2000 in the United Kingdom. The study explored three themes, the use of electronic information in everyday life, the use of telecentres by local communities in everyday life and community involvement strategies in the design, development and implementation of telecentres. Results led to development of a framework to inform future community based ICT initiatives. The findings and methods used to analyse the data are relevant to both future study of community based ICT initiatives and the broader areas of information seeking, information seeking behaviour and user needs. Consequently, it is hoped they will be used by other researchers wishing to take a qualitative approach when studying in these areas. This paper will report findings relating to the use of electronic information in everyday life, setting these findings within the context of the whole study. The PhD study referred to in this paper is available online (Ellen, 2000), and readers are referred to sections of the thesis for additional detail. It should be noted that the paper presents a picture of developments in community based ICT initiatives as they stood when the thesis was submitted in January 2000. Where appropriate, significant new developments have been mentioned, as have studies in everyday information seeking that have been published since the beginning of 2000. In 2001 the Library Association set up a number of Policy Advisory Groups including one which focused on National Information Policies (Muir and Oppenheim, 2001). Amid such activity implementation of major initiatives by different government departments continue apace. In the thesis, I argued that these developments were being implemented without due consideration of lessons that should have been learnt from established community based ICT initiatives. Major projects under development (such as the UfI, the National Grid for Learning, the Public Library Network and the development of ICT Learning Centres (since rebranded as UK online centres) were predominantly aimed at providing access to ICT for those who do not have access elsewhere. Similar provision already existed in many communities across the UK in the form of telecentres. In 1998 there were approximately 200 of these centres, many of which offered access to ICT, training courses and advice and support relating to IT. Despite the existence of these centres, planned government provision did not acknowledge the role of telecentres in community based access to ICT. Furthermore, development of government initiatives continues at such a speed that insufficient attention has been paid to learning lessons from existing CBA, such as telecentres. Whilst the motives behind government projects for increasing skills levels and preventing social exclusion are good, the argument here is that time should be spent examining the extent to which people use existing CBA sites. Put simply, if there are factors affecting use of existing CBA sites it is important to identify these factors before further CBA sites are developed. Failure to do so may result in new initiatives failing to meet the needs of the communities that the provision has ostensibly been designed for. Unfortunately, such research had not been carried out to inform the development of government policy in this area. It is within this context that the present study was undertaken and the aims and objectives of the study set to address this gap in research. The study had everyday life as its focus because government plans for provision of access to electronic information promise to transform everyday life (Blair, 1999). Consequently, everyday information seeking was chosen as the subject of this research. As telecentres are the most long-standing and established example of community based access to ICT they provided the focus for this research. The study was qualitative and exploratory because it was the first of its kind. No previous work was identified which examined use of electronic information and use of telecentres to access electronic information from the viewpoint of users and non-users. This study addressed this gap in knowledge and it is hoped that it will represent a starting point for further research, perhaps on a larger scale, which could confirm or disprove findings from this small scale, in-depth study. This study explored the use of electronic information in the context of everyday life. This was achieved by focusing on one example of community based access, the telecentre, to investigate the extent to which these facilities were being used by people in communities to access electronic information. The study examined access and use of electronic information and telecentres from the viewpoint of the user and non-user to identify factors affecting access and use of both electronic information and telecentres. The study also examined the use (and non-use) of community involvement strategies in the design, development and implementation of telecentres. What information do people need in their everyday lives? How do they approach finding it? To what extent is electronic information used in everyday information seeking? Do some information needs lend themselves more favourably to using electronic information? What factors affect use of electronic information? To what extent are telecentres used by people in communities to gain access to electronic information? What factors affect access and use of telecentres? Finally, the third theme related to identification of community involvement strategies used to include communities in the design, development and implementation of telecentres. This theme was addressed by examining strategies used, and to what extent and in what ways communities had been involved. Results from the study were then used to propose a framework to inform future community based ICT initiatives. Thus the study's contribution to knowledge consists of pioneering empirical research and the development of a policy framework drawn from a community perspective. As previously stated there was a need for research which examined what current CBA sites were being used for and the extent to which electronic information was being used by communities so that such research could be used to inform future community based ICT initiatives. Past research (Ellen, 1997) and involvement in Communities on-line also pointed to a need to explore the issue of community involvement in the design, development and implementation of CBA sites. The literature review outlined past research which focused on three different examples of CBA sites. A review of previous studies revealed a paucity of research addressing the questions posed for this study. Few studies were identified which focused on users of CBA sites, the majority of work in this area was from an organizational perspective, involving interviews with staff and key actors. This study addressed this gap in research by interviewing users, non-users and key actors to provide a more complete picture of telecentre use in everyday life from the viewpoint of the community, rather than from an organizational standpoint, an area which has received little attention either in past research, or by government policy makers. This study demonstrated the contribution that community members can make in informing policy (and thus future development), simply by asking them in a non-intrusive way to talk about how and for what purpose they use CBA. Results were then used to develop a framework to inform future community based ICT initiatives. The literature review was based around the study's three themes. Models of information seeking were explored, focusing on user-centred models and previous studies which included categorisation of information and sources (relevant to the research question of how people approach finding information needed in everyday life). There are various reviews of literature in this area which are useful starting points for identifying relevant models (Dervin and Nilan (1986), Hewins (1990), Siatri (1999) and Sugar (1995). Amongst the most widely cited user-centred models considered were: Wilson (1981) whose model has been called the holistic model; Dervin (1976, 1983, 1992) whose model is called Sense-making; Kuhlthau (1991, 1990, 1993) who developed the 'information search process'; and Marchionini (1995) who focused specifically on information seeking in electronic environments. This paper will concentrate on Sense-making, which was used as a framework for this study. Sense-making has been utilised in studies across a range of disciplines (Dervin, 1983). The most notable of these relate specifically to everyday information seeking (Dervin 1976; Chen and Hernon 1982 and Dervin, 1984). The combination of relevance to the present study and the approach this framework used for data collection made it the most appropriate model amongst those reviewed. ...assess how patients/audiences/users/clients/citizens make sense of their intersections with institutions, media, messages, and situations and to then apply the results in responsive communication/information system design. (1995: 5). Dervin's research background is communication studies, which may explain the wide focus of her work. Wilson's call for a holistic approach (Wilson, 1981) focuses on information, whilst Dervin's interest in the relationships between institutions, media, messages, and situations promised a wider view of information seeking in the context of everyday life. Another aspect of Sense-making that suited this exploratory study, was the approach taken to data collection. Open-ended questions (within a structured interview framework), which avoid leading respondents into talking about what they perceive is required of them is a characteristic of this method (Dervin, 1989). Data is collected by framing questions which ask respondents to identify situations, gaps faced, gaps bridged, and helps them to make sense of situations. The key technique used in interviews to collect data is the 'micro moment time line interview'. Respondents are asked to reconstruct a situation recounting the steps that occurred (time line steps). Further detail is then requested for each step. The aim of this process is to gain an understanding of how the respondent saw the situation, gap and help; i.e., where they wanted to be after crossing the bridge. This technique has been compared to critical incident technique, developed by Flanagan (1954). Critical incident technique has been successfully used in LIS research (Fisher and Oulton, 1999) and whilst it was considered, Sense-making was chosen in preference to Flanagan's method because of its wider focus. Critical incident technique involves asking respondents to discuss an incident in detail (like the micro moment time line), but it differs from Sense-making in being very focused, whilst Sense-making takes a wider approach, not wanting to impose the researcher's interest on the respondent. This allowed electronic information use and telecentre use to be explored in the context of everyday life, rather than asking respondents to discuss an incident where they had used electronic information or the telecentre. In assessing the suitability of Sense-making as a framework, critiques of Dervin's work were sought. Only one was identified (Savolainen, 1993) which examined the differences between Sense-making and other approaches. Other researchers that had used Sense-making did not reflect on the utility of Sense-making as a framework for research. For example, Durrance (1982) used aspects of a Dervin research instrument, but did not comment on its utility. A formal source is defined as a source, oral or recorded that responds, and is perceived as - and is intended to be - relevant to a particular problem that is officially put in place by an organisation (the software vendor, the work place, etc.) to help users [to learn how to do word-processing]. An informal source is defined as a source that is used outside the formal channels. (Bergeron & Nilan, 1991: 24). Whilst it was possible to utilise a definition of formal and informal information sources no suitable categories for information sources were identified. This lead to the development of tactics categories during the study, which were used to address the research question 'how do people approach finding information in everyday life?' This is discussed below. This definition places information in its widest context and enables an open exploration of everyday information seeking appropriate to the aims of this study. The origin of studies which explore everyday information seeking can be traced back to the United States, where, in the 1970s and 1980s a number of studies were undertaken which focused on the general population. These studies involved interviewing the general public about their everyday information needs. The most widely cited of these studies is the Baltimore study (Warner, et al., 1973). Building on the results and data analysis schemes of the Baltimore study were the Seattle study (Dervin, et al., 1976), the New England Study (Chen & Hernon, 1982) and the California study (Dervin, et al., 1984). There were three common elements across these four studies. Firstly, the use of a coding scheme for everyday information needs. The scheme was developed to provide a set of 'mutually exclusive and exhaustive categories into which all citizen information needs could be classified' (Dervin 1976: 23). The scheme consisted of 19 major categories and 154 subcategories. This scheme was the most extensive classification of everyday information needs identified, and was adopted and subsequently extended for this study. The second common element amongst these studies was the approach taken to examining everyday information seeking, which aimed to see 'information' in its widest sense. This was achieved by avoiding use of the word 'information' during interviews, instead asking respondents to discuss recent situations where they 'needed to find the answer to a question, solve a problem, make a decision...' (Chen & Hernon 1982, p.25) and to describe what had helped and what had hindered in dealing with the situation. This open-ended approach was designed to develop a picture of the total information environment, rather than just focusing on formal sources. The key reason for this approach was that previous research had identified (and continues to identify) a preference for using informal information sources. A recent study of the information seeking behaviour of senior executives also adopted this approach after a pilot study revealed that use of the term 'information' was limiting the sources that respondents said they used because they did not consider talking to colleagues as part of information gathering (Keane, 1999). The third common element across the four studies was their size. The Baltimore study involved around 1,300 participants, the Seattle study interviewed 500, the New England study 2,400 people from six states, and the California study interviewed 1,040 people. Whilst these studies used interviews, rather than surveys for data collection, a further common element was that the analysis and results from these large scale studies were wholly quantitative, comprising statistical tables with little or no examples of information needs and how people had dealt with them. Considering the Sense-making framework within which these studies were undertaken which calls for a user-based perspective, rather than a system-based perspective, this trend was disappointing. No smaller scale studies, using the common framework were identified which took a more qualitative approach. In this respect, the present study differs because it is small scale and departs from this wholly quantitative approach to analysis by providing a mix of qualitative and quantitative treatment of the data. This allowed for more in-depth analysis of everyday information seeking, and the extent to which electronic information is used. More recently, little research has been published which examines everyday information needs across the general population, as did the four studies described above. A number of studies were identified which focused on a subset of the general population. In 1996, 300 low income African Americans in Texas were surveyed, and in-depth interviews undertaken with 50 volunteer households (Spink et al., 1999). Harris and Dewdney (1994) examined the effectiveness of information and referral agencies (called formal help systems) in meeting the needs of abused women, concluding that most of the available services were inadequate. Williamson (1997 and 1998) studied 202 older adults (over 60) in Australia focusing on 'incidental information acquisition' (p.23). Williamson termed her study 'ecological' because it built a picture of information in the context of the lives of the people in the sample. The concept of incidental information acquisition distinguishes between behaviour where the search for information is the primary motive and where it is incidental. A similar research theme was explored by Ross (1999) whose qualitative study of 194 pleasure readers included instances where they had read a book for pleasure that had made a significant difference in their lives (particularly after reading biographies, autobiographies, histories and novels). As a result of this research Ross called for an expanded definition of information seeking and use, to include books that are read for pleasure. Savolainen (1995a, 1995b) interviewed 22 Finnish residents and developed a framework for the study of everyday information seeking (called way of life and mastery of life). This definition omits an important source of information of value to citizens as part of their everyday life; information provided by non governmental organisations, voluntary groups and community organisations. The more common term for these information sources is 'community information' (Leech, 1999). Marcella and Baxter do not explain the rationale for excluding these information sources. For a more detailed discussion of the Marcella and Baxter study, see Ellen, 2000: 30-33. Discussion of other barriers was less extensive. Dervin (1976) discusses barriers to information accessibility between the citizen and the information source, particularly bureaucratic barriers (which links to Chen and Hernon's institutional barrier). Both Dervin (1976) and Chen and Hernon (1982) discuss the tendency for agencies to consciously, or unconsciously withhold services from citizens with the most difficult problems to make their success statistics look more favourable. Studies cited by Chen and Hernon (1982) which discuss withholding services include Levin and Taube(1970) and Sjoberg, et al., (1966). Williamson (1997, 1998) found that amongst 202 elderly Australians barriers included cost and fear. These findings have implications here in the UK, in terms of government plans to move provision of information and services to electronic format, within a country where a large proportion of the population is over 60, out of the educational loop and for whom lifelong learning may not seem appropriate in retirement (Blake, 1998). Other studies that focused on older people and ICT showed that despite ageist attitudes about older people not wanting to embrace new technology (Sixsmith & Sixsmith, 1995), such attitudes are not supported by research. The BBC programme You and Yours (Carr, 1999) featured 'silver surfers', reporting a growing number of older people using the Web. Consideration of access to electronic information for those whose first language is not English is also an important issue. The language barrier and strategies to address access to electronic information was the focus of a project which ran between 1997 and 1998 at Toronto Public Library in Canada (Lavery and Livingston, 1999). The project involved developing a programme for introducing adult learners to the Internet, focusing on those with low literacy levels and people for whom English is a second language (ESL). Experience from this project revealed that categories of information of particular interest for ESL users were international daily newspapers, interactive ESL quizzes and puzzles and e-mail (for contacting relatives abroad). Software that enables blind and partially sighted people to hear the content of electronic information spoken to them (programs such as JAWS and HAL) have been found to be useful to people with low literacy levels and people with dyslexia. However during the period of study these programs were not usually available at public access sites because of their high cost (JAWS costs 2,500 for a five-user licence). In Bury, Greater Manchester the visually impaired persons librarian found that reader software (PW Webspeak) was invaluable for people with low literacy levels and dyslexia because it helped them to practice their readings skills (Making the Connection seminar, 1998). This demonstrates that there is clearly benefit to a wide range of people who may have difficulty accessing electronic information in having such programs within CBA sites. Since the PhD was submitted in January 2000, a number of authors have published papers relating to everyday information seeking. The subject of everyday information seeking has been featured at the third ISIC conference (The Third International Conference on Research in Information Needs, Seeking and Use in Different Contexts, Hoglund and Wilson, 2001) and in a special journal edition (Spink & Cole, 2001). This research activity demonstrates that the area of everyday information seeking is one of growing interest. The studies published since January 2000 can be broken down into those which focus on particular groups of the population, those which focus on a topic for information seeking and those that provide a methodological contribution to this area of research. The following sections briefly outline these studies. Within the most recent literature studies of particular groups within the general population form the largest group of papers on everyday information seeking. Wicks (2001) focused on Canadian independent older adults in a qualitative study which investigated whether the degree of independence of older adults influenced the types of sources chosen. The study also examined whether electronic information was an effective form of communication amongst older adults. Another study which focused on adults (Klobas and Clyde, 2000) looked at their Internet use. Three studies examined issues associated with access to information for disabled people (Craven, 2000; Schmetzke,, 2002 and Williamson et al, 2001). Four studies focused on women, (Davies and Bath, 2002; Harris et al. 2001; Higgins and Hawamdeh, 2001 and Marcella, 2001). Given (2002) examined the overlap between everyday and academic information seeking behaviour amongst mature undergraduate students. Hersberger (2001) utilised Dervin's categories developed during the Seattle study (outlined above) for a study which focused on the everyday information needs and sources of homeless parents. In addition to the studies listed above which focus on particular groups within the general population, there are also a growing number of studies which focus on a specific topic. For example, Cline and Haynes (2001) and Khalil (2001) focus on consumer health information. Nicholas et al. (2002) have been studying the 'digital information consumer' in a large scale study using log files to examine use of online news sites and health sites such as NHS Direct. Savolainen (2001) focused on consumer information within an Internet newsgroup. Methodological contributions include Marcella and Baxter (2001) who provide a detailed description of their 'random walk sample', which was used during a British Library funded study outlined above. This sampling method was developed from Market Research providing detailed instructions to interviewers enabling them to be rigorous about their choice of homes to sample. Carey et al. (2001) discuss the issues associated with studying three distinct groups of the population (pregnant women, self-help support groups and pre school children). These papers provide important details about qualitative studies of everyday information seeking. In reviewing the literature on community based access three different types of access were examined; telecentres, libraries and community networks. The decision to concentrate on telecentres for the study was made because of these three types of access, telecentres were the only CBA sites where the main focus was provision of ICT access and promotion of the use of ICT. Community networks tend to concentrate on development of community information and libraries main focus is on book lending and paper based reference services. Since the study was completed many branch libraries have opened ICT Learning centres as part of the establishment of the People's Network, but this is still not their primary focus. Research into telecentres (also known as telecottages, community technology centres, CTSC or community teleservice centres, electronic village halls and most recently ICT learning centres) has tended to concentrate on organizational aspects of these centres such as the importance of clear aims and objectives, issues around sustainability, balancing economic and social objectives, critical success factors, management and control structures, importance of evaluation, etc. (Staplehurst, 1994; Burt, 1995; Lancaster, 1999). Graham (1992) was alone in proposing best practice in developing telecentres. This work was based on research carried out in East Manchester by the Centre for Applied Social Research (CASR) in the early 1990s (Ducatel et al., 1993; Ducatel and Halfpenny, 1993; Shenton et al., 1991). Two reports commissioned by IBM as part of their Living in the Information Society project examined community based ICT initiatives in a wider sense (telecentres and community networks), with a focus on social inclusion (INSINC, 1996; Day & Harris, 1997). Lancaster (1999) examined telecentres with some association with libraries observing that it had proved difficult to find three case study sites where the telecentres were thriving. The review identified a significant gap in research in this area; work which examined telecentres from a community-centred, rather than organizational perspective. What were people using telecentres for, why were some people not using them, what prevented use and what helped? Of the studies identified only two (Mark et al., 1997 and Liff et al., 1999) began to address these issues. Mark et al., (1997) examined the impact of Community Technology Centres (CTC). The study focused on the impact of educational programmes, rather than drop-in access to ICT and did not involve interviews with non-users. Liff et al., (1999) compared telecottages (another terms for telecentres) and cybercafes in an international study, which in the later stages of the two year project (November 1997-October 1999) included questionnaires for users and non-users. What makes the present study distinctive, when compared with the Liff et al., (1999) is that the views of users and non- users take centre stage, making the present study the first truly community-centred study. At the time of the study, libraries were only just beginning to provide community access to ICT, when compared to telecentres, some of which had been established as early as 1989. Indeed, in the 1998 edition of Information Technology in Public Libraries Batt recalled that when data was collected for the 1994 edition 'the Internet did not fall within the consciousness of the public librarian' (Batt, 1998, p.15). Since Ormes and Dempsey (1995) surveyed library authorities in 1995 growth has been rapid, with public access points increasing from 39 in 1995 to 321 two years later (Batt, 1998, p.17). Planned growth with the People's Network is for 40,000 access points as part of a vision for delivering what the public expect from a library in the 21st century (Library and Information Commission, 1997a). Since the present study was completed this People's Network is being implemented, with a target of 4,300 UK online centres to be established within public libraries, which form part of an overall figure of 6,000 UK online centres across the country by the end of 2002.
network barrier; a lack of access to telecommunications networks Where individual connections to the network are not viable, provision of access at a single place (i.e. a community access point such as a telecentre) may be cost effective. service barrier; where access to the telecommunications network exists, but where only limited services are available, which may not be appropriate to a community's needs (for example services may be designed for an urban environment and are not applicable to a rural situation) to provide not only telephone services, but also computer and multimedia-based services such as access to databases, to training via distance learning, etc. within a contact that can be orientated to local needs. cost barrier; the cost of purchasing equipment (and ongoing costs) is prohibitive to provide communal access to IT equipment, reducing the individual costs (i.e., at a community access point such as a telecentre). qualification barrier; skills required to use computers are high, and may not always be present. Additionally, some may be sceptical about IT. by integrating on-the-spot training courses and advisory activities into the telecentre. This requires that telecentres are run by trained and competent persons. Other research which has discussed factors affecting access and use of community based access to ICT identified lack of interest, relevance and an absence of appropriate skills within the community in order to make services accessible as issues in establishing a telecentre (Ducatel & Halfpenny, 1993). These could be placed within Qvortrup's qualification barrier. A community audit (Shenton et al., 1991) revealed a series of concerns amongst community members which indicated a lack of involvement by the community in the process of establishing a telecentre in the area. People did not see why funding was available for the centre when other community services were cut, could not see what benefits the telecentre would bring that were not achievable by other means and were concerned about limited staffing of the centre and an absence of specific outreach workers. The example of the East Manchester study demonstrates the importance of community involvement in the design, development and implementation of community based ICT initiatives. The work undertaken by CASR (Shenton et al., 1991; Ducatel & Halfpenny, 1993; Graham, 1992) highlighted problems associated with adopting a top down approach to community based ICT initiatives. More recent studies have also indicated the importance of community involvement (INSINC, 1996; Day & Harris, 1997). Examples of good practice in this area were identified. In Manchester, the Women's Electronic Village Hall (at the time only an idea) carried out a feasibility study, asking local women what they thought about establishing a women-centred IT centre (Girbash, 1991). In Hereford and Worcester a network of Community Resource Centres, developed at the request of local communities, are run by the communities themselves. In recent years PCs with Internet access have been added, but only where communities involved have wanted this to happen. In County Durham members of Trimdon village carried out a village appraisal which included a positive response to a question about establishing a 'community based information and communications centre'. The results provided a picture of what villagers hoped Trimdon could become by the year 2000 (CIRA, 1997). These examples counter the commonly held view that communities cannot be involved in the design, development and implementation of community based ICT initiatives because they do not know what can be achieved with technology (Mitchell, 1999). One idea that moves towards addressing the issue of how to involve communities in ICT initiatives, particularly during development, is a game developed by Mackie and Wilcox (1998) for Communities Online. The game was developed as a way of bridging the gap between communities and IT developers and was designed to facilitate communication by both parties about what was needed/could be achieved. The aims and objectives and how they linked together are shown in Figure 1 which provided a conceptual framework for the study. 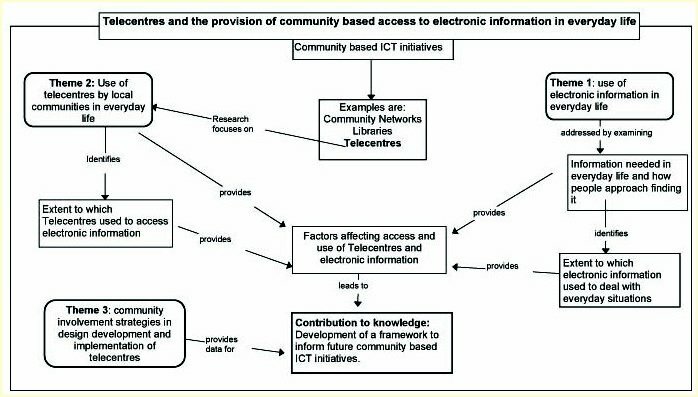 The conceptual framework illustrates how the three key themes from the study were developed, and how the different research questions were addressed to generate data used to form a framework for future community based ICT initiatives. Data was collected in 1998, with a pilot study of an urban telecentre undertaken to test all aspects of the research instruments to be used for the main study. Following the pilot, two telecentres were studied, one rural, one urban and the aim was to interview ten users and ten non-users as well as key actors (those involved in establishing telecentres or running them) at each site. The exploratory case study method (Yin, 1994) was chosen, and the study can be described as two exploratory case studies at the level of the telecentres, combined with an exploratory purposive sample at the level of the key actors within telecentres, telecentre users and non-users. A total of forty-seven users and non-users was interviewed across the study. Telecentre sites and respondents were given anonymity. Consequently, the names of the places where the telecentres were located have been changed. For theme one (use of electronic information in everyday life), Sense-making (Dervin1983) was used for data collection (see Sense-making above). A research instrument developed from a previous study (Dervin et al., 1976) was adapted with respondents asked to detail everyday 'problems, worries and concerns' that they had faced in the past month and how they had dealt with these situations. Respondents were asked open-ended questions without using the terms 'information', 'information needs' and 'sources of information'. This open-ended approach to the question of information needs and use addressed research questions about information needed in everyday life and how people approach finding it. This method enabled the study to determine the extent to which electronic information had been used to deal with everyday situations without deliberately asking direct questions about electronic information use. Once data relating to information needs and use had been gathered, respondents were asked to talk about use of electronic information in relation to a series of hypothetical questions. Hypothetical situations were used to enable comparisons between respondents information seeking strategies. This generated a number of factors affecting use of electronic information which, in addition to respondents own everyday situations which had involved electronic information use, were used to develop the framework to inform future community based ICT initiatives. For theme two (use of telecentres in everyday life), interviews with telecentre users and non-users were carried out, using Sense-making. Use of this method enabled the study to develop a picture of electronic information use at telecentres which did not lead respondents into talking specifically about use of electronic information, thus achieving the aim of establishing the extent to which telecentres were being used to access electronic information. This method was also used to identify factors affecting use of telecentres by asking users what 'helped and hindered them' when using the telecentre. Non-users were asked what hindered them, and what would help them to use the telecentre. This data was used to inform the framework for future community based ICT initiatives. Finally, the third theme (identification of community involvement strategies used to include communities in the design, development and implementation of telecentres) was addressed by asking key actors about past and current community involvement strategies. In addition, any comments made by users and non-users (i.e. helps and hindrances in using the telecentre) were also utilised. Results from this aspect of the study were also incorporated into the framework to inform future community based ICT initiatives. Initial coding was carried out by detailed examination of transcripts using Atlas/ti, a software package designed to process qualitative data for analysis (see www.atlas.de, Kelle, 1996, 1997). Codes were assigned inductively from the data using Atlas/ti which led to generation of summary tables showing occurrences of different tactics (strategies) for dealing with information needs. Detailed analysis of hypothetical situations was possible because of the small scale of the study, enabling analysis by individual as well as across each case study site. This method of initial analysis is illustrated in Table 2 below. In Table 2 above columns 2-11 in the table (headed with 'primary documents') represents an individual respondent and the codes in column one show the various tactics given by each respondent for this hypothetical situation (barking dog). For example, respondent 35 mentioned five tactics for dealing with this situation; contact the council for action, seek legal advice, move house, work co-operatively with other neighbours and speak to the neighbour with the dog. Further conceptual analysis was undertaken by developing three new methods for analysis of the strategies used in everyday information seeking; 'tactic analysis', 'tactic categories' and the 'centrality of electronic information use', which are discussed below. Use of Atlas/ti (as a means of managing a large volume of data) enabled development of these three methods of analysis which represent the first qualitative analysis of everyday information seeking. These are discussed below. When analysing the data collected on everyday information seeking the basic numeric representation of whether a respondent had mentioned a tactic or not (as shown in Table 2 above) was supplemented by in-depth analysis, which will be called 'tactic analysis'. This was achieved by revisiting verbatim data and noting the stage at which a code was mentioned in a respondent's description. Additional data displays were created by replacing the 0s and 1s (as shown in Table 2 above) with a number that corresponded to the order in which each tactic was used. This original technique enabled analysis of the point in the information seeking process that each 'tactic' was used - rather than just showing that a tactic had been used. As one of the aims of Sense-making was to elicit step by step descriptions of what people did when dealing with situations (or might do when discussing hypothetical situations) this approach provided a summarised view of each respondents narrative of how they had moved through everyday situations. This technique meant that it was possible to examine each respondents individual path through a situation providing a level of detail about everyday life information seeking not seen before. 'Tactic analysis' also meant that it was possible to identify in what context respondents had used electronic information. Table 3 below provides an example of 'tactic analysis' for the hypothetical situation involving a health problem requiring a second opinion for one respondent. By using the codes developed from the data, and ordering the step by step description in this way, we can clearly see that this 58-year-old woman said that she would initially use the library, looking for subject specific information by reading books. She also said that she would use the Web, and would try to contact other sufferers. The data displays developed provide the full list of tactics developed from the study, so we can not only see the tactics each respondent said that they would use, we can also see the range of tactics other individuals mentioned. For example, whilst the respondent featured in Table 3 mentioned 5 tactics, across the study, 36 different tactics were mentioned. With the hypothetical situations, 'tactic analysis' was then used to compare individual responses across the study and to compare frequency information (as shown in Table 3 above) with whether there was agreement across the study regarding which tactics would be used first or second (called prime tactics). Summarised tables were then created for both frequency data and prime tactics. Once again, 'tactic analysis' also provided a way to show the extent to which use of electronic information fitted in to respondents tactics for the hypothetical situations, and whether electronic information was seen as a prime tactic across the study. issues/questions (tactics which involved issues or questions relating to a situation). These 'tactic categories' enable all information seeking strategies to be examined and contrasted with other studies. The 'centrality of electronic information use' was utilised for respondents' real situations and not the hypothetical situations because respondents were hypothesising about how they would deal with a situation, not describing actual strategies they had used. This method of analysis, when used in conjunction with 'tactic analysis' and the 'tactic categories' described above could be used to determine the level of centrality of other media or particular information sources. As mentioned in the introduction, this paper concentrates on results relating to theme one of the study; use of electronic information in everyday life outlined above. Results across the whole range of everyday information needs are presented, to provide a context for those where electronic information was used. Results from the present study are also compared to those from the Seattle study (Dervin et al., 1976). Summarised information about one topic (consumer concerns) is provided to demonstrate how results were presented. Situations where electronic information was mentioned are summarised focusing on centrality of electronic information use. Examples of results for both real and hypothetical situations are given to illustrate how tactic analysis and tactic categories were used. Finally results relating to factors affecting use of electronic information are provided. Building on the topic categories and subcategories called 'topic focus codes' developed during the Seattle Study (Dervin et al., 1976) results were broken down into the areas shown in table 5.1 below. Results from the present study are compared with those from the Seattle study (Dervin et al., 1976) which involved 500 respondents. A new code category was created to cover 'Internet related concerns' as none of the categories from the Seattle study were suitable. Table 4 reveals that consumer-related situations predominated amongst the 47 people interviewed, with 20% of situations involving consumer-related concerns. As can be seen from the table, both studies had a broad spread of situations across the different topic focus categories, demonstrating the variety of information respondents needed in everyday life. The most frequently mentioned topics differed across the two studies, but three topic categories featured in the top five across both studies (child care, family and personal, employment and financial matters). Whilst the high number of mentions for the childcare family and personal category may be explained by its (too) wide topic focus, encompassing three separate areas of concern, this was not the case for employment or financial concerns. Looked at another way, results from the present study show that across a range of information needs (broken down into the 16 topic focus categories) none covered more than 20% of the total. This was also true of findings from the Seattle study. The implications of these results for CBA sites relates to provision of access to electronic information (as more information is stored electronically). CBA sites need to be able to meet the wide range of information needs articulated during the present study. It is encouraging to note the similarity of results from a small scale in-depth study involving 47 respondents and a large scale study. Given the added benefits of in-depth analysis of respondents' approaches to finding information (not undertaken during the large scale studies) that were possible with a smaller number of respondents, this was a welcome outcome. For the real situations, a wide variety of everyday situations was articulated. Fifty-eight different topic focus codes were used for interviews with 47 people, with 100 different situations presented. Whilst it is not possible to report full results in this paper, in order to provide an example of the results of the study, details of consumer concerns are provided. Table 5 below shows codes, code descriptions and the number of mentions across the study. Nine different topics were used for consumer concerns. Six of these were within the twenty most frequently mentioned topics in the study. Consumer-Quality was the topic which appeared most frequently (six times). The Consumer category also provided seven out of the thirteen instances of electronic information usage. Electronic information was mentioned under Consumer-Product-Information for hotels in New York and information about booking tickets at the Sydney Opera House; Consumer-Quality for problems related to finding information on the web about camping in Montpellier; Consumer-Service Information for information about travel times on buses and trains and Consumer-Other outlined above. Thirteen situations were described which involved using electronic information given by nine respondents out of a group of forty-seve, with two people mentioning more than one situation involving electronic information. Where these situations were described in detail, using Dervin's 'micro moment timeline interview' it was possible to place tactics in the order in which they were used because respondents were asked to describe the situation step by step. In addition, because of the small scale of the study it was also possible to present summarised results under tactic categories with each step numbered, so that it was possible to see what an individual did first, second, third and so on. While it is not possible to present these results in full, to illustrate this, one respondent's situation is presented here. Betty (a 60-year-old woman) described a situation where she had needed to know about local yoga classes. She had been advised by her physiotherapist to take up yoga, and wanted to attend local classes because she relied on public transport. A wide range of both formal and informal information sources was used for this situation. The library was used as the seventh tactic, after she had exhausted other ways of finding out about yoga classes. It was when she made enquiries at the library that Betty began to feel frustrated. A Community Information Network (CIN), (a computer based information system) had replaced a box file of local information that Betty had used many times in the past. With the help of a library assistant, she looked on the CIN to see if there was any information about local yoga classes. The only information available was about a national organisation based in London. The library assistant suggested she ask at the local health clinic, which she did, without success. During another visit to the library she mentioned that the health clinic had not helped, and staff suggested she try the CAB. Much of Betty's account of this situation involved issues and questions that it had raised for her, most of which related to her initial visit to the library. For example, she asked if the information from the box file had been transferred on to the CIN. She was so frustrated by the lack of local information on the CIN that she said she thought of volunteering to do it herself. The library Betty used had a sign over its entrance which read 'information point', yet, despite two visits, staff there were unable to assist her in finding the information she needed. electronic information was not central to the situation. These results show that for ten of the thirteen situations where electronic information was used (77%), it was either the only way information was sought, or was central to the situation. The differences between the three situations where electronic information was not central related to problems with using electronic information (for information about post-graduate courses, and wanting information about yoga classes). Electronic information was not central to dealing with contacting the Sydney Opera House because the e-mail she had sent remained unanswered, offering no help or information to her. An attempt to use a Community Information Network to find out about local yyoga classes was unsuccessful (and only one of a number of different tactics used in the search). For information about post graduate courses electronic information use would be restricted to sending an e-mail to an academic. The Web would not be used, because it would take too long and cost too much. These results indicate that when used, electronic information was an important element in dealing with real situations. At the same time, when all 100 situations are considered, the extent that electronic information was used across this study was limited. Four hypothetical situations were provided; looking for a new home some distance away (new home); a health problem requiring a second opinion (health); a situation involving a neighbour's barking dog (barking dog) and a need for a new television (new TV). As outlined in the Methods section above, data from hypothetical situations were examined in terms of frequency of use and prime tactics (those most frequently mentioned first or second). Prime tactics were derived from tactic analysis of individual respondents step by step descriptions of how they would deal with the hypothetical situations. This data was then summarised to generate prime tactics across respondents at each site. Results showed that there were similarities between tactics which were frequently mentioned and prime tactics. Table 8 below summarises results across the four situations by looking at prime tactics as a proportion of all tactics mentioned for each of the four hypothetical situations. Results show that there were similarities in the approaches respondents said they might use when dealing with each of these situations, but that each situation was approached very differently. 'You want to find a new place to live, somewhere that is a hundred miles from your current home. What steps would you go through in order to deal with this situation? Is there anything in particular that you would try to find out or understand that would help you deal with this? What would you try to find out? Table 9 below summarises results for this situation. Respondents provided nineteen different assessment tactics. These ranged from very specific assessments, such as what the library was like, to more general assessments, for example, what the community in an area was like. Eleven tactics were categorised as actions, with a visit to the area being the most frequently mentioned tactic for the situation. Thirteen tactics were categorised as issues or questions. In some cases these assessment tactics involved information sources, but for others personal observation played an important part. For example, a number of respondents spoke of 'assessing areas' by driving around. Equally, 'actions' were other tactics not usually mentioned in studies of information seeking. One woman described how she would do voluntary work in an area to get a sense of what the community was like. The present study clearly demonstrates that by concentrating on information sources important strategies can be neglected. The contention here is that actions, assessments, issues and questions need to be given as much attention as information sources when studying everyday information seeking. This point is illustrated by Table 10 below, which summarises the number of tactics mentioned for each of the four hypothetical situations, using the four 'tactic categories' developed during the present study. Almost as many assessment tactics (19) were mentioned across the study as information sources (20) for the new home situation. Equally, with the barking dog situation concentration on information sources required to deal with the situation would provide a very incomplete picture of ways respondents might approach the situation. Only three information sources were mentioned compared to seventeen actions. Table 11 below summarises results showing the number of respondents that mentioned using the Internet as one of their tactics for dealing with the hypothetical situations. These summarised results indicate that respondents across the study could envisage using electronic information for three of these everyday situations. The most prevalent use of electronic information was found for the new home and health situation. This indicated that the new home and health situations lend themselves more favourably to electronic information use than the barking dog and new TV situations. No one mentioned using electronic information for dealing with the barking dog situation. Fifteen people mentioned using some aspect of the Internet for finding a new home a distance away from where they currently lived. At the two main study sites 14 respondents mentioned using the Internet as one tactic in dealing with a health situation. A smaller number (5) mentioned using the Internet in relation to buying a new TV. ...we cannot discover how users best work with systems until the systems are built, yet we should build the systems based on knowledge of users and how they work. (1995: 75). The hypothetical situations posed a series of non-threatening questions, which, in conjunction with 'tactic analysis' provide the means for basing early prototypes of electronic information system design on knowledge of users and how they might approach situations. The method used in the present study of collecting and analysing data from hypothetical situations provided a richness of information that can be used in system design. Taking the new home situation as an example, 'tactic analysis' could provide the basis for a Web-based system which enables people to gather information about buying a new home at a location a distance away from where they currently live. Since the field research was carried out a number of sites have been developed which have gone some way towards offering this type of information (e.g. www.homesight.co.uk) but many estate agents sites on the Web have simply reproduced the service they provide on the high street, despite the potential that a hypertext environment such as the Web can provide in terms of information provision. This method also offers the potential for those without experience of IT to participate in system design. In this study, asking relevant, non-threatening questions which concentrate on respondents' everyday experiences rather than technology provided the basis for a framework to inform future community-based ICT initiatives. This question was explored by asking respondents a series of direct questions at the end of the interview about their use or non-use of electronic information for the four hypothetical situations. Responses to these questions gave a wealth of information about factors affecting use of electronic information. These results are drawn from the main study only (n=39) as pilot respondents were not asked about use or non-use of the Internet for the hypothetical situations. If only I could sit in front of a computer go on the Internet and find out lots and lots of things I want to know, I would love it, I really would. Well, it's the, it's typing up what I want to ask, you know, spelling what I want to ask. Factors affecting use of electronic information had similarities with factors affecting use or non-use of telecentres. Briefly, use of telecentres to access electronic information for the everyday situations outlined was low across the telecentres. These results were also reflected in a telephone survey of UK telecentres, which demonstrated low levels of Internet usage. Factors that hindered usage included cost - people found other ways of addressing their information needs, either by using sources which did not involve ICT, or by using access elsewhere (college, friends and family), where connection costs were borne by others. Problems with opening hours and reliability of equipment also hindered people's use of telecentres. The resource issues that these results raise suggest that co-operation between various Community based access sites within communities would be a more effective way of providing access to ICT than for each location (telecentre, school, library, healthy living centre, etc.) setting out to offer training, technical support, search techniques and so on. Sharing the resource implications of community based access to ICT would be a more effective use of limited resources. This paper has presented results from PhD research, focusing on one of three research themes; the use of electronic information in everyday life. As with the larger-scale Seattle study (Dervin et al., 1976) a wide range of information needs were presented by 47 respondents, across a broad spread of different topic focus categories. The implications of these results for CBA sites relates to provision of access to electronic information (as more information is stored electronically). CBA sites need to be able to meet the wide range of information needs articulated during the present study. It was encouraging to note the similarity of results between a small-scale study involving 47 respondents and a larger scale study involving 300. Given the added benefits of in-depth analysis of respondents approaches to finding information, this outcome suggests that there is value in conducting further small-scale studies. Development of tactic analysis, tactic categories and centrality of electronic information use provide a series of tools for such in-depth studies. When used in conjunction with a framework such as Sense-making for data collection, these methods provide a means of undertaking qualitative studies. Results presented here have demonstrated that by widening the scope of a study beyond 'information', additional strategies can be revealed which affect information seeking behaviour. The contention here is that actions, assessments, issues and questions need to be given as much attention as information sources when studying everyday information seeking. It is suggested that the data analysis methods outlined here can be applied across a broad range of disciplines, including systems design and are particularly appropriate for qualitative studies of information seeking, information seeking behaviour and user needs. Since the study was completed UK Government initiatives such as the People's Network and the development of ICT Learning Centres (called UK online centres) has occurred quickly, and as argued at the beginning of this paper, little has been learnt from existing CBA sites such as telecentres. An evaluation of pilot UK online centres called for a balance of revenue to capital funding for further centres of at least 4:1 (Hall Aiken Associates, 2001). Unfortunately this balance did not materialise. Instead, the ratio was reversed with 1:4 being the average with revenue funding under New Opportunities Fund (NOF) and capital funding through the Capital Modernisation Fund. This leads to serious concerns about how new centres will be able to provide support to new users that this study clearly showed was needed. Charging for access to the Internet is something that has been left to individual centres, meaning that a lack of adequate revenue funding may mean that some centres are unable to provide free access. Development of access points in libraries through the People's Network has also raised concerns, with no universal free access to electronic information across the UK libraries at present (Baigent, 2001). NOF have indicated that they expect free access in libraries to be the norm (Time..., 2001), yet there appears to be no commitment to funding connectivity or revenue costs adequately. The work reported here was undertaken as a Ph.D. student in the Department of Information and Communications at Manchester Metropolitan University. I would like to thank my supervisory team, Shelagh Fisher, Dr. Francis Johnson and Jonathan Willson for their guidance and support. I would also like to acknowledge the interest, encouragement and support given by Professor Peter Halfpenny (University of Manchester). Thanks also to the anonymous referees for their comments on the original draft of this paper. The Making the Connection Seminar on providing public access to the Internet in Greater Manchester public libraries, was organised by Bury Metro Libraries and Isaware. It was held in Bury Town Hall, July 8th 1998, but no proceedings or papers were published. Reed, R (1998) "Community Resource Centres in Hereford and Worcester." Paper presented at the Telecottages seminar held at Manchester Town Hall, September 9th 1998. Agada, J. (1999) "Inner-city gatekeepers: an exploratory survey of their information use environment". Journal of the American Society for Information Science 50(1), 74-85. Batt, C. (1998) Information technology in public libraries, 6th ed. London: Library Association. Bergeron, P. and Nilan, M.S. (1991) "Users' information needs in the process of learning word-processing: a user-based approach looking at source use." The Canadian Journal of Information Science 16(2), 13-27. Blair, T. (1999) "Why the Internet years are vital". The Guardian 25 October 1999, p.8. Blake, M. (1998) "Internet access for older people." ASLIB Proceedings 50(10), 308-315. Bruce, C.S. (1995) "Information literacy: a framework for higher education." The Australian Library Journal 44(3), 158-170. Carr, R. (1999) Silver surfers feature on BBC Radio 4 You and Yours magazine programme broadcast 20th October 1999. Case, D., Borgman, C.L. & Meadow, C.T. (1985) "Information seeking in the energy research field: the DOE/OAK project." In: ASIS 85 Proceedings for the 48th ASIS Annual Meeting 1985, 22, pp. 311-336. New York, NY: American Society for Information Science. Carey, R. F., McKechnie, L., & McKenzie, P. J. (2001) "Gaining access to everyday life information seeking." Library and Information Science Research, 23(4), 319-334. Chatman, E.A. & Pendleton, V.E. (1995) " Knowledge gap, information-seeking and the poor." Reference Librarian Nos. 49/50, 135-146. Chen, C.C. & Hernon, P. (1982) Information seeking: assessing and anticipating user needs, London: Neal-Schuman Publishers, Inc.
Cline, R. J. W. & Haynes, K. M. (2001) " Consumer health information seeking on the Internet: the state of the art." Health Education Research, 16(6), 671-692. Craven, J. (2000) "Good Web design principles for the library website: a study of accessibility issues in UK university libraries." The New Review of Information and Library Research, 6, 25-41. Cobbledick, S. (1996) "The information seeking behaviour of artists: exploratory interviews." The Library Quarterly 66(4), 343-372. Day, P. & Harris, K. (1997) Down to earth vision: community based IT initiatives and social inclusion. London: IBM and Community Development Foundation. Davies, M. M. & Bath, P. A. (2002) "Interpersonal sources of health and maternity information for Somali women living in the UK: information seeking and evaluation," Journal of Documentation, 58(3), 302-18. Dervin, B. (1983) An overview of sense-making research: concepts, methods and results to date. Paper presented at the International Communication Association meeting, Dallas, Texas, May 1983. Dervin, B. (1984) Information needs of Californians — 1984. Report 1: Technical report. Report 2: Context, summary, conclusions, implications, applications. Davis, CA: University of California, Institute of Governmental Affairs. Dervin, B. and Nilan, M. (1986) "Information needs and uses" Annual Review of Information Science and Technology, 21, 3-33. Dervin, B. (1989) "Users as research inventions: how research categories perpetuate inequities." Journal of Communication 39(3), 216-232. Dervin, B. (1992) "From the mind's eye of the user: the sense-making qualitative-quantitative methodology." In: Glazier, J.D., ed. Qualitative research in information management, pp. 61-84. Englewood, CO: Libraries Unlimited Inc.
Dervin, B. (1995) "Chaos, order and sense-making: a proposed theory for information design." In: Jacobson, R., ed. (1999) Information Design, Cambridge, MA: MIT Press. Dervin, B. (1999b) Personal communication between Debbie Ellen and Brenda Dervin, 10 August, 1999. Ducatel, K. & Halfpenny, P. (1993) "Telematics for the community? An electronic village hall for East Manchester." Environment and Planning C: Government and Policy 11, 367-379. Ducatel, K., Shenton, N., Graham, S., Halfpenny, P. & Scott, D. (1993) Community Teleservices Project: an evaluation of the Manchester electronic village hall initiative. Manchester: University of Manchester, Centre for Applied Social Research. Durrance, J.C., (1982) "A model for the selection of factors which affect the public policy information needs of citizen groups." Library Research 3, 23-49. Eager, C. & Oppenheim, C. (1996) "An observational method for undertaking user needs studies." Journal of Librarianship and Information Science 28(1), 15-23. Ellen, D. (1997) An evaluation of Manchester Community Information Network. Manchester: Manchester Metropolitan University (M.Sc. dissertation). Fisher, S. & Oulton, T. (1999) "The critical incident technique in library and information management research." Education for Information 17(2), 113-125. Flanagan, J.C. (1954) "The critical incident technique." Psychological Bulletin 51, (4), 327-359. Girbash, C. (1991) Feasibility study for a Women's Electronic Village Hall in Manchester. Manchester: Pankhurst Centre. Given, L. M. (2002) "The academic and the everyday: investigating the overlap in mature undergraduates' information-seeking behaviors," Library and Information Science Research, 24(1), 17-29. Graham, S. (1992) Best practice in developing community teleservice centres. Manchester: University of Manchester, Centre for Applied Social Research. Harris, R.M. and Dewdney, P. (1994) Barriers to information: how formal help systems fail battered women, Westport, CN: Greenwood Publishing Group. Harris, R., Stickney, J., Grasley, C., Hutchinson, G., Greaves, L., & Boyd, T. (2001) "Searching for help and information: abused women speak out." Library and Information Science Research, 23( 2), 123-141. Hersberger, J. (2001) "Everyday information needs and information sources of homeless parents." New Review of Information Behaviour Research, 2, 119-134. Hewins, E.T. (1990) Information need and use studies. Annual Review of Information Science and Technology, 25, 145-172. Higgins, S., & Hawamdeh, S. (2001) "Gender and cultural aspects of information seeking and use." New Review of Information Behaviour Research, 2, 17-28. Hoglund, L. & Wilson, T.D. (2001) "Introduction: a special issue on studies of information seeking in context." New Review of Information Behaviour Research, 2, i-iii. Keane, D. (1999) "The information behaviour of senior executives," in: Wilson, T.D. & Allen, D.K., eds. Exploring the contexts of information behaviour: proceedings of the Second International Conference on Research in Information Needs, Seeking and Use in Different Contexts, 13-15 August, 1998, Sheffield, U.K., London: Taylor Graham. Kelle, U. (1996) "Computer-assisted qualitative data analysis in Germany." Current Sociology 44(3) 225-241. Khalil, F. E. M. (2001) "Consumer health information: a brief critique on information needs and information seeking behaviour." Malaysian Journal of Library and Information Science, 6(2), 83-99. Kuhlthau, C.C., Turock, B.J., George, M.W. & Belvin, R.J. (1990) "Validating a model of the search process: a comparison of academic, public and school library users." Library and Information Science Research 12, 5-31. Klobas, J. E. & Clyde, L. A. (2000) "Adults learning to use the Internet: a longitudinal study of attitudes and other factors associated with intended Internet use," Library and Information Science Research, 22(1), 5-34. Kuhlthau, C.C. (1991) "Inside the search process: information seeking from the user's perspective." Journal of the American Society for Information Science 42(5), 361-371. Kuhlthau, C.C. (1993) "A principle of uncertainty for information seeking". Journal of Documentation 49(4), 339-355. Lavery, J. & Livingston, B. (1999) "Introducing the Internet to adult learners." Computers in Libraries 19(4), 52-53. Library and Information Commission. Working Group on Information Technology (1997a) New library: the people's network. London: Library and Information Commission. Liff, S, Watts,P. & Steward, F. (1999) "E-Gateways as innovative organisations - different approaches to social inclusion". Paper delivered at Conference on Inclusion in the information society: e-gateways as new social places for cyberaccess, Aston University Business School, Birmingham, 16 December, 1999. Marcella, R. & Baxter, G. (1999) Citizenship information: final report of a project funded by the British Library Research and Innovation Centre. London: British Library Research and Innovation Centre. (BLRIC Report no. 173). Marcella, R. & Baxter, G. (2000) "The information needs and the information seeking behaviour of a national sample of the population in the united kingdom, with special reference to needs related to citizenship." Journal of Documentation 55(2), 159-183. Marcella, R. & Baxter, G. (2001) "A random walk around Britain: a critical assessment of the random walk sample as a method for collecting data on the public's citizenship information needs," The New Review of Information Behaviour, 2, 87-104. Marcella, R. (2002), "Women on the Web: a critical appraisal of a sample reflecting the range and content of women's sites on the Internet, with particular reference to the support of women's interaction and participation." Journal of Documentation, 58(1), 79-103. Marchionini, G. (1995) Information seeking in electronic environments, Cambridge: Cambridge University press. Moore, N. & Steele, J. (1991) Information intensive Britain: an analysis of the policy issues: a study, London: Policy Studies Institute. Nicholas, D., Gunter, B. & Withey, R. (2002) "The digital information consumer." Library + Information Update, 1(1), 32-34. Ross, S.R. (1999) "Finding without seeking: what readers say about the role of pleasure-reading as a source of information." In: Wilson, T.D. and Allen, D.K., eds. Exploring the contexts of information behaviour: proceedings of the Second International Conference on Research in Information Needs, Seeking and Use in Different Contexts, 13-15 August, 1998, Sheffield, U.K.. pp. 343-355. London: Taylor Graham. Savolainen, R. (1993) "The sense making theory: reviewing the interests of a user centred approach to information seeking and use." Information Processing and Management 29(1), 13-28. Savolainen, R. (1995a) "Everyday life information seeking: findings and methodological questions of an empirical study." In: Hancock-Beaulieu, M. and Pors, N. eds. The First British-Nordic Conference on Library and information Science, 22-24 May 1995, Copenhagen, pp. 313-331. Copenhagen: The Royal School of Librarianship. Savolainen, R. (1995b) "Everyday life information seeking: approaching information seeking in the context of 'way of life'." Library and Information Science Research 17, 259-294. Savolainen, R. (2001) "'Living encyclopedia' or idle talk? Seeking and providing consumer information in an Internet newsgroup, "Library and Information Science Research, 23(1), 67-90. Schmetzke, A. (2002) "Accessibility of web-based information resources for people with disabilities, " Library Hi Tech, 20(2), 135-136. Secker, J., Stoker, D. & Tedd, L. (1997) "Attitudes of library and information science professionals to current awareness services: results from a user needs survey, using focus groups for the NewsAgent project." In: Beaulieu, M. ed. Library and information Sstudies: research and professional practice, Proceedings of the 2nd British-Nordic Conference on Library and Information Studies, Queen Margaret College, Edinburgh, 1997, pp. 249-258. London: Taylor Graham. Shenton, N., Ducatel, K., Halfpenny, P. & Scott, D. (1991) Community technology audit: East Manchester Electronic Village Hall Manchester: University of Manchester, Centre for Applied Social Research. Siatri, R. (1999) "The evolution of user studies." Libri 49(3) 132-141. Sixsmith, A. & Sixsmith, J. (1995) "'Gerontechnology': new technology and the older person." Generations Review: Journal of the British Society of Gerontology 5(3), 11-12. Sjoberg, G. Brymer, R.A., & Harris, B. (1966) "Bureaucracy and the lower class." Sociology and Social Research 50, 325-337. [Cited in: Chen, C.C. and Hernon, P. (1982) Information Seeking: Assessing and Anticipating User Needs, London: Neal-Schuman Publishers, Inc.
Spink, A., Bray, K.E., Jaeckel, M. & Sidberry, G. (1999) "Everyday life information seeking by low-income African American households: Wynnewood Healthy Neighbourhood Project." In: Wilson, T.D. and Allen, D.K., eds. Exploring the contexts of information behaviour: Proceedings of the Second International Conference on research in information needs, seeking and use in different contexts, 13-15 August, 1998, Sheffield, U.K., London: Taylor Graham. Spink, A. & Cole, C. (2001) "Introduction to the special issue: everyday information-seeking research," Library and Information Science Research, 23(4), 301-304. Sugar, W. (1995) "User-centred perspective of information retrieval research and analysis methods." Annual Review of Information Science and Technology, 30, 77-109. Summers, E.G., Matheson, J. & Conry, R. (1983) "The effect of personal, professional, and psychological attributes, and information seeking behaviour on the use of information sources by educators." Journal of the American Society for Information Science 34(1), 75-85.
" Time to let out the ICT secret." (2001) Library Association Record, 103(10), 580. Vaughan, L.Q. (1997) "Information search patterns of business communities: a comparison between small and medium sized businesses." Reference and User Services Quarterly 37(1), 71-78. Wicks, Don A. (2001). "'Go with the flow: independent older adults and their information seeking." InCampbell, D.G. ed. Beyond the web: technologies, knowledge and people. Proceedings of the 29th Annual Conference of the Canadian Association for Information Science, Universite Laval, Quebec City, Quebec, May 26-29, 2001. pages 149-164. Toronto: Canadian Association for Information Science. Williamson, K. (1997) "The information needs and information-seeking behaviour of older adults: an Australian study." In: Vakkari, P., Savolainen, R & Dervin, B., eds. Information Seeking in Context: Proceedings on research on Information Needs, seeking and use in different contexts, 14-16 August, 1996, Tampere, Finland, pp. 337-350. London: Taylor Graham. Williamson, K. (1998) "Discovered by chance: the role of incidental information acquisition in an ecological model of information use." Library and Information Science Research 20(1), 23-40. Wilson, T.D. (1981) "On user studies and information needs." Journal of Documentation 37(1), 3-15. Yin, R. K. (1994) Case study research: design and methods, 2nd Edition. London: Sage Publications Ltd.